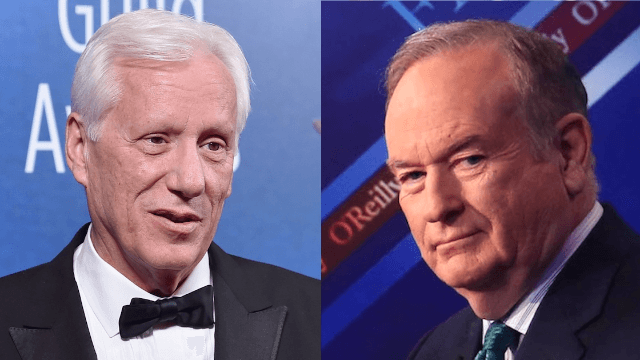 James Woods has a theory why Bill O'Reilly was really fired. You'll never stop rolling your eyes. On Wednesday, Fox News officially fired its most famous anchor, Bill O'Reilly, after The New York Times reported that they had paid $13 million to silence five women who had accused him of sexual harassment. In the days since the Times article was published, dozens of sponsors dropped The O'Reilly Factor, and many of O'Reilly's accusers came forward with disturbing tales of him grunting at them and calling them "hot chocolate." Everybody turned on this guy (except the president), so it was clear to see he was on his way out. But now that his firing is official, one outspoken celebrity believes he alone has figured out the real reason O'Reilly was ousted. Yes, it's conservative icon and death celebrator James Woods. He shared his conspiracy theories with Twitter. Aha! Fox News just didn't want to pay Bill O'Reilly anymore, even though he was by far their most profitable anchor. It makes so much sense! Clearly, Woods feels deeply betrayed by the cable news network he once loved. Sorry Woods, looks like you'll be smelling that liberal taint no matter where you stick your nose. But he wasn't done. Less than a half hour later, he had changed his mind. Now he knew the real REAL reason O'Reilly had been canned. YES! This time he's got it. Everyone knows how much Fox News hates old white men. With that mystery solved, we can all relax. Bill O'Reilly is just another innocent victim of prejudice.